Melabev was the very first organization in Jerusalem to provide safe, pleasant, caring day centers for older adults with declining memory or cognitive skills. The staff of the Melabev day care centers also offers support and guidance to the family members who shoulder the main responsibility for a frail relative, helping them make it possible to keep their loved one at home, in the familiarity of the community. The goal of Melabev is to forestall the institutionalization of the older adult for as long as possible. The very name, Melabev, is an acronym for the Hebrew phrase: Center for caring for the older adult in the community – מרכז לטיפול בקשיש בקהילה. Over 30 % of the older adults who attend Melabev centers are Holocaust survivors. Both first and second generation Holocaust survivors are well represented among the family members of our clients, our donors, the friends and the administration of Melabev. One of the members of our greater “Melabev Family,” Baruch Goldstein, wrote a book of his experiences before, during and after the war entitled, “For Decades I was Silent: A Holocaust Survivor’s Journey Back to Faith,” which was published by the University of Alabama University (2008). Those of us deeply involved with Melabev know Baruch Goldstein as a smiling, genial, personable man, who was deeply devoted to his wife, Riva (Rivka). In the introduction to his memoirs, Baruch Goldstein describes a key moment in his long, arduous journey, which began long before we had the privilege of meeting him here in Jerusalem. We came to learn of a major turning point in his life after the war, well after the physical horrors of the Shoah had ended, at a time when he was still emotionally depleted, a displaced person in Italy, subject to depression and waiting to go to Palestine. He received a letter, which began, “Dear Friend,” from a young woman in the United States, Riva Golinkin, who he did not yet know. That letter, with its warm salutation, marked the beginning of his transition from trauma to healing. But let me start at the beginning of Baruch’s story. Goldstein begins the thrust of his narrative centuries earlier with a synopsis of the earliest known history of the Jewish population of his birthplace, Mlawa, a small town in Poland, and continues into the 1920s. In his opening chapters, in which he describes the overwhelmingly traditional, orderly community of his childhood before the war, his highly-esteemed extended family and his gentle, loving, devout parents, younger sister and brother, he already establishes the significance of religious faith and how it was intertwined in his family’s life. Talmudic studies, faith and observance were integral aspects of his identity during these formative years – yet he also describes, fondly and respectfully, the many other shades of Jewish expression, particularly among the young people of Mlawa. A sensitive adolescent, he meticulously notes the shocks and disruptions accompanying each downward stage leading to the destruction of his family and community during the Shoah. While a yeshiva student in Warsaw during the 1930s, he observed dangerous anti-Semitic trends from their very beginnings. At various phases of anti-Jewish upheaval, his innocence was challenged. Although he records the crushing response to the latest horrors of the moment, he also iterates the inability, even in his worst fears or nightmares, to perceive the ultimate evil that would befall European Jewry until it was impossible to ignore. Throughout the book, Goldstein places the situation of his family and their community within the context of factually recorded events, using only the most professional and reliable historical sources. The book includes maps and detailed citations in the end notes, along with a glossary. Following the Nazi conquest of Poland, the challenge of maintaining any semblance of normalcy, of securing basic needs, became nearly overwhelming. When both his grandmothers die, one immediately after the other in part due to the hardships of their forced move from Mlawa, he expresses the frustration of his father, in particular, who could not save them, and the sadness and mourning and the tears that flowed. Yet, he simultaneously notes that at least these pious grandmothers both had traditional burials and were the last members of his family in Poland for whom that was possible. Goldstein, one cousin, and later his mother and brother, strive to return to Mlawa from Lubartow, near Lublin where they had been taken in a relatively early phase of the war. Back in Mlawa, at least he and his brother might find some work to sustain them. On first arriving there, however, he was imprisoned for several months and it was a mark of “freedom” of sorts when he was able to enter the ghetto that had been constructed in their absence. During and after his imprisonment, he was grateful for each contact he had with any member of his extended family – even if it was only a desperate wistful glance from a favorite aunt across the road who could not communicate with him further. Goldstein describes the gratuitous cruelty of the Gestapo, such as the painful, humiliating beatings to which they subjected him and the cruel murders of good, heroic people, several of whom he knew and admired. Yet, he continued to cling to his faith, reciting prayers from memory during his slave labor, as he continued to hope for the reunification of his family. In November of 1942, his mother, then in her mid-40s, was sent via the first deportation from Mlawa to Treblinka. 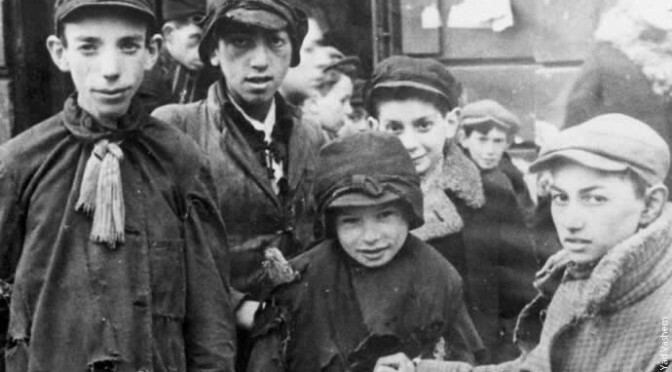 Soon after, he and his younger brother were deported to Auschwitz, where they were separated. Goldstein never saw him again. He only learned much later that at about the same time his father and sister were also murdered. Not knowing the precise details of his family’s fate during the next two years, he endured in Auschwitz, hoping that at least his sister might have survived. While struggling to maintain the will to live himself, he still had the strength to bring others with little Jewish background into an understanding of the faith. With the Russian advances, and the closing of Auschwitz, Goldstein was forced on the death march into the outlying camps of Buchenwald, where conditions were no better and often worse than before. Yet he held on, often with the help of friends, particularly two young men from Mlawa. Their three-some formed a mutual support team. When liberation finally came – the day he long awaited – he was too weak to be aware of it, and despite his friends’ care, he collapsed. Later he regained consciousness in a hospital bed in Thereisienstat. He still lived in fear, felt emotionally numb. His faith was depleted, as he was skeptical of G-d and man. He was depressed and unable to make any decision about the direction of his life or where to go next. He followed some friends – there were several young survivors from Mlawa guided by representatives of the Jewish Agency – first to northern Italy and then to the southern part of the country, and finally Bari, where he waited in a DP camp with a group going to Palestine. In the library there, he discovered the American Yiddish newspaper, the Forward, which published information on survivors searching for their far-flung relatives. In October of 1945, an uncle in New York and an aunt in California contacted him through letters. Knowing he had relatives who cared about him gave him a renewed feeling of belonging, despite the distance. Soon after he was offered a job in Rome, but he still felt lost, with no clear direction. The letter that he received which began, “Dear Friend,” from Riva Golinkin arrived and with it gradual changes were set in motion. Riva was also European born, although she and her parents and brothers had been living in America for several years. Her father was an Orthodox rabbi in New England, and her brother, a rabbinical student, lived in Pittsburgh. Riva, who was studying and working in New York, went for a much needed rest to California – where by chance she met and befriended Goldstein’s aunt. Riva was deeply touched by the letters that Goldstein had sent his aunt, thus motivating Riva to correspond with him directly. Plans soon developed in their exchange of letters: Goldstein qualified for a visa as a yeshiva student and there was a yeshiva that agreed to accept him. Although Goldstein was torn by the fact that he was no longer observant, and had considered going to Palestine rather than the US, in the US he had this budding relationship and he had family. That decided it. He now had a destination and a compass with which to reach it. Indeed, he describes the warm welcome he received from his uncle, aunt and cousin in New York, and how they opened their small apartment to him. Riva, too, had been waiting for him at the dock. His healing progressed a few weeks later when he accepted the invitation to Riva’s parents’ home for Pesach. She and her family provided the ballast he needed. He felt comfortable in her home. The way Rabbi Golinkin (Riva’s father) conducted the seder and the services in his shul felt familiar to Goldstein, though he had neither enjoyed a holiday experience nor been in a synagogue for more than eight years at that point. He felt at home with traditional practices, so he set aside his theological and philosophical doubts, and decided to confront them at a later time. Riva’s loving concern bolstered his self-confidence. The young couple became engaged, and after their marriage they lived in the Golinkin house. Rabbi Golinkin encouraged Goldstein to continue his studies – in English, in other secular fields and in Talmud, leading to his ordination. Like Elie Wiesel whom he quotes, Rabbi Baruch Goldstein’s religious faith was never again the same as before the Shoah.Still, there is a deep commitment and profound understanding that he reaches and articulates most eloquently in the penultimate chapter called, “Faith after the Holocaust.” Ultimately, he has faith in the survival of the Jewish people and what he calls the mystery of Jewish history. Throughout the last section of his book, there are hints of a mature faith intertwined with family life and his hopes for the future, for himself personally and for the Jewish community. Rabbi Goldstein traces the various positions he held, in Jewish education and the Conservative congregations where he served as rabbi. At one point in the ’70s, he was asked to present a course on the Holocaust, although at that time he had barely discussed his experiences except with Riva in the more than three decades since the end of the war. His course was very well received, and, following his retirement from the rabbinate, he became a frequent lecturer on the Holocaust. He feels obligated to speak and write about it. “Humans committed those evils against humans and it is up to humans to become more humane.” He appeals for tolerance. The Goldstein’s son, Israel Meyer, received the best Jewish education possible. Ultimately when Meyer obtained a one-year fellowship to Hebrew University, his parents joined him and his family during that year in Jerusalem. It was during that time that we at Melabev came to know the gracious, gentle Rabbi Baruch Goldstein and his wife, Riva, who stayed on after Meyer’s return to the US. Only when Riva’s health declined did they also go back to the United States, shortly before she passed away. We were privileged, during the course of his work on his memoirs, in seeing Baruch Goldstein several times during his extended visits here, when he used his Jerusalem apartment as his writing pad. Producing his book was another journey for him, and we were so pleased with its publication. Goldstein made one trip back to Mlawa in the late 90s with his family. No Jews live there anymore. He writes of feeling gratified in being able to walk past the settings of much happiness in his childhood. The trip, however, did not bring closure, because he cannot forget what happened in the years that followed those happy times.